The harbour village of Boscastle is in Minster parish on the rugged North Cornwall coast. You may wish to explore the many circular walks and visit Boscastle Harbour Village. There are quaint shops, craft centres, a witches museum, a visitor's centre, old inns and restaurants, three rivers and three churches to visit. Boscastle harbour is one of Britain's oldest working harbours that is still used today. A spectacular blow hole is an attraction one hour before low tide. The sudden surge of water in and out of the hole then reports back like the boom of a gun. The Heritage Coast Dept. of North Cornwall have a wonderful programme of guided walks. For relaxation, local beaches at Bossiney Haven and Trebarwith Strand offer sandy stretches whilst Castle Beach at Tintagel is more for walkers and scenic value. From Exeter take A30 just past Launceston at the Kennard's House exit signed to North Cornwall take the A395 after about 9 Miles you will see sign posts to Boscastle where you will turn right. 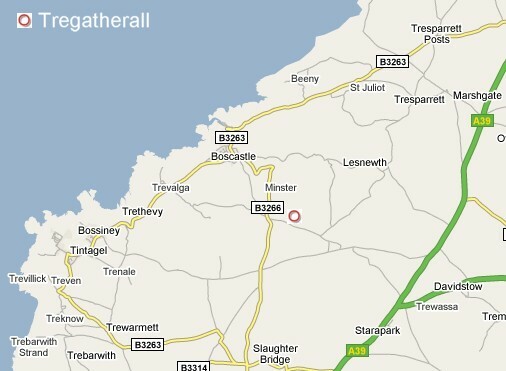 You will come to the A 39 where you turn left and then immediately right follow that road to the B3266 at the T junction turn right to Boscastle. Follow this road for about 1/2 mile, then take the first right there is a small B&B sign, Tregatherall Farm is the first on your left. From Boscastle car park follow the road to the top of the hill, take the left hand turn to Camelford past the Bottreaux garage, follow the road up the hill out of the village and take the left hand turn at the top of the hill signed to Davidstow. 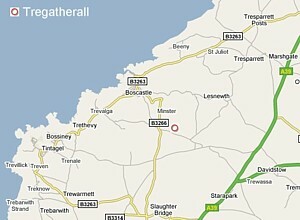 Tregatherall farm is the first on the left.